Today am going to share with you the best blogging apk apps essential for every blogger. You can use these apps for making posts, editing posts, read and reply comments, sharing of posts, reviewing your SEO reports, monitoring of your site analytics etc which makes blogging life much easier than ever. As we know that smartphone is taking massive head than a personal computer (pc) because of it's easy to handle and carry around, reliable, portable and fashionable. So I just made the best essential apps to maximum benefits from blogging. You can complete your daily tasks and schedules in an easier way with these Android blogging apps. 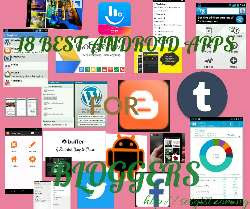 Blogger is a great blogging app in my list of best Android apps 2017 for Google bloggers ( Blogspot users). You can create a post, edit and update an existing post, view list of published and drafted posts etc. 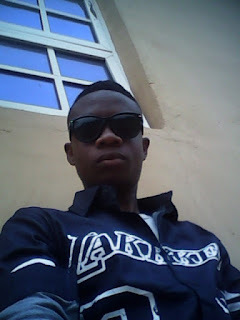 Wordpress is the best app for wap-admin users ( Wordpress ). It helps you to write, edit and publish posts, monitor your site's role and analytics and your visitor's usage, Read and reply comments, follow your favorites sites and read, like and comment on their site through this app. You can even post with HTML Code, Change your theme and also you can customize your site. All these features in one app making it more like a web browser. Tumblr is a great app for bloggers and webmasters. It works as a social media and blogging platform and at the same time as a website. You can access the new post, draft posts, edit, share images, gifts, videos, music, links, and texts easily with this app. It is the best app to bloggers when it comes to monitoring your website statics and performance. Every blogger both newbies and pro never neglect the work of Google Analytics. It's developed by Google Inc. Monitor your site visitors, page views, unique users, returning user, bounce rate, visitor's landing page, session, existing page, most search results and even more. 5# Twitter: Twitter is one of the best social apps to boost your page rank. You can tweet your posts, reply and retweet post. A blogger that does not use this app is missing a great thing. It is one of the best apps you can use to create a post, novels, and even stories. This app is easy and fast responses to use. Another great blogging app for Wordpress, Blogspot and LiveJournal bloggers. Also a great sharing platform. You can also embed your videos and images from YouTube, Picasa, flickers etc. This is similar to the Google Analytics tool and both perform the same functions. The free version contains Ads, so if you can not cope with it you better use Google Analytics. The touchpad keyboard is a keyboard app that every blogger must have, it makes it easier to write with three suggestions floats at the top while typing. With the auto-correction feature, colorful layouts and support up to 50 languages. RSS feed Reader app. when you subscribe to any website by their RSS feed, you can easily read their post. when it comes to sharing, buffer App is the best to go. you can share to facebook, twitter, Googe+ and LinkedIn at a click. Although there are many sharing apps such as Hootsuite and social pilot I still recommend buffer app. If you have a facebook page where you share your blog posts. Here is the app to manage your Facebook page, reply to fan messages, update status, boost post with facebook ads promotion and handle your page and post insight. Helps you monitor your site's uptime and downtime. You can monitor when your blog was an outage and you can resolve the outage by improving root causes. This is also a great application for bloggers, it keeps you in touch with the latest stories, news, videos, and images around the world. It is developed by Google Inc., you can upload data file such as PDF&office documents, music files, images, and videos etc. Google Drive allows you to upload up to 15GB data in one google account. You can share uploaded files publicly anywhere on the web. Another best blogging app in dictionary category. It has more than 2,000000 definition and synonyms from the dictionary and thesaurus.com. it also has audio pronunciation, word origin, idioms and phrases, word history, voice search, favorite words, abbreviations, and much more features is also there. You can edit your photos, crop, draw over the image, easy rotation, resizing, adjust color, effects and many more. Do you have more blogging apps? do share with us using the comment box. Really great resource. I would also suggest DrumUp https://drumup.io/ . Curation, management, scheduling, suggestions - it features it all and so much more!